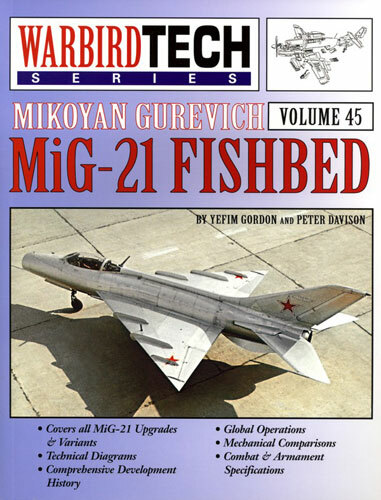 Learning from the experience of the Korean War and with a nod to Dassault and Saunders Roe delta designs, the MiG-21 Fishbed emerged from a 1953 operational requirement for a new lightweight fighter for Frontal Aviation (VVS) use. Similar to the F-104, which emerged from what the US perceived as the lessons of Korea, the MiG design resulted in a compact tailed delta capable of Mach 2 in level flight and equipped with simple avionics for fire control. Entering Soviet service in 1960-1, the MiG-21 would ultimately serve with many WARPAC and client state air forces with derivatives still in service today in many countries. Volume 45 of the Specialty Press Warbird Tech Series sees Yefim Gordon and Peter Davison again teaming up to produce a useful reference work on the subject type. This book is broken down into the standard sections one expects from these titles. Chapters on genesis, design, development and variants form the first half, whilst one covering service history and exports form a substantial bulk of the volume. 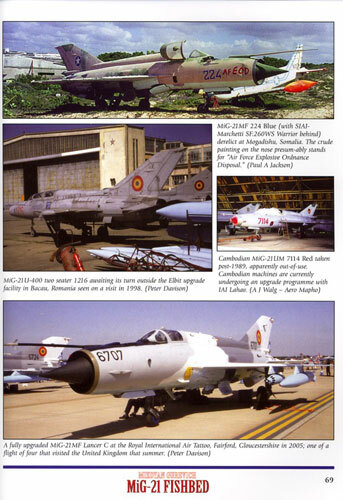 As the MiG-21 went through a substantial redesign during production a chapter is also devoted to the second generation types. As always Gordon includes contemporary photographs of the type in service and often comments on the camouflage and markings development of the respective users. Amongst the final chapters is a section on production of the MiG-21 in China, which has resulted in the F-7 family which remains in widespread service today. “Shooting to Kill” quite obviously details the MiG-21s extensive combat record in the Middle East and South East Asia, where the MiG-21 gave the USAF a run for its money due to poor weapons, tactics and ROE on the US side. Unsurprisingly a detailed examination of the airframe with many close-up photos is also included. The Fishbed has proven to be a very versatile design, developing many new roles which Gordon addresses in this volume. Major upgrades such as the IAI Lancer program and the MiG-21-93 are detailed, although oddly not much attentions is paid to the Indian BISON program which has seen the MiG-21 evolve into a potent BVR fighter. 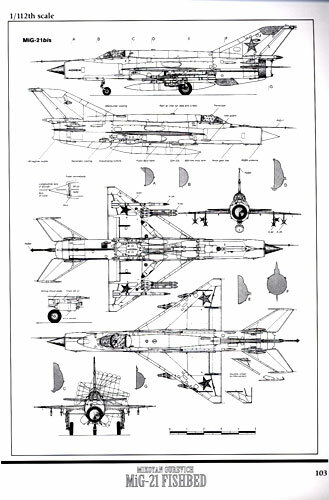 Concluding the book are short appendixes which address foreign users, modelling the MiG-21 and finally some well rendered technical drawings. Once again, this Warbird Tech volume is of very high quality and a worthy investment for modelling reference. The book will serve both history buffs and modellers well. With the Eduard MiG-21 family recently announced to add to the already prolific kits on the market this volume will have wide appeal for modellers.